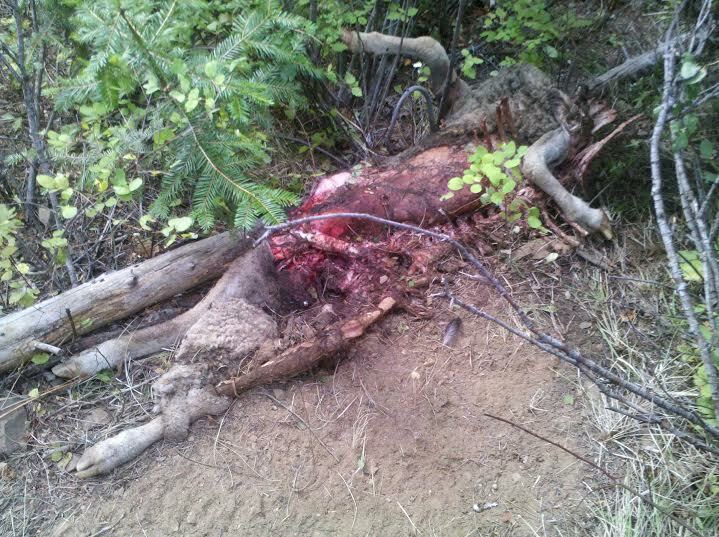 One of the sheep killed by the Huckleberry pack that has been skinned by WDFW investigators to confirm a wolf killed the animal. 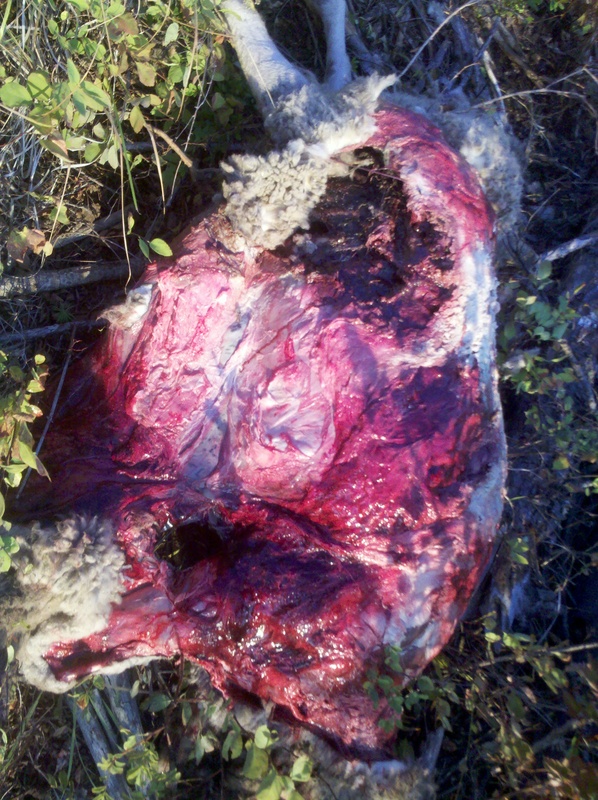 Remains of a sheep killed by wolves on the Dashiell ranch. 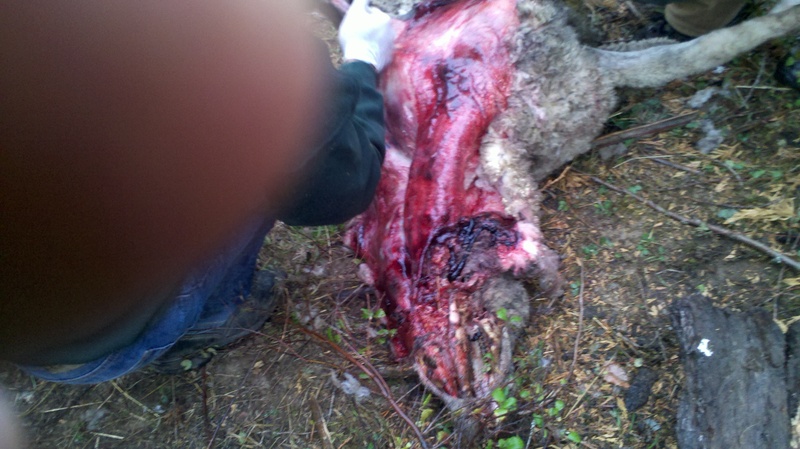 A sheep that has been skinned by WDFW investigators and is being examined. from preying on flock of sheep OLYMPIA – A rancher and state wildlife officials working to herd a flock of 1,800 sheep away from the site of recent wolf attacks in southern Stevens County today received authorization to shoot wolves that approach the flock. Phil Anderson, director of the Washington Department of Fish and Wildlife (WDFW), today authorized livestock owner Dave Dashiell, of Hunters, and agency field staff to use limited lethal measures and preventative steps to avoid additional attacks on the flock. Since Aug. 14, WDFW has confirmed that wolves killed 16 sheep in four separate incidents on leased forest land near Hunters, a small community about 48 miles northwest of Spokane. The latest attack occurred the night of Aug. 18. Nine other sheep found prior to Aug. 14 had decomposed to the point where the cause of death could not be determined. Signals from a radio collar attached to a male wolf in the Huckleberry Pack show the animal was at the site, likely with other pack members, when the attacks occurred, said Nate Pamplin, WDFW wildlife program director. Necropsies of the carcasses confirmed the sheep were killed by wolves, he said. To further protect his sheep, the livestock owner has removed the carcasses of dead animals where possible to do so and kept his flock on the move around the grazing areas, Pamplin said. Help the livestock owner find an alternative grazing area away from the Huckleberry Pack. Capture and collar additional wolves in the pack to provide additional information on their movements. Be prepared to shoot wolves in the vicinity of the livestock owner’s sheep. Neither WDFW staff, nor the livestock owner, who was also authorized to shoot wolves in the vicinity, will actively hunt the wolves or attempt to draw them into range. In 2011, the U.S. Fish and Wildlife Service removed gray wolves from the federal list of endangered species in the eastern third of the state, but the species is still protected under Washington state law. The state Wolf Conservation and Management Plan and state laws set the parameters for responding to wolf predation on livestock. The Huckleberry Pack, confirmed as the state’s seventh wolf pack in June 2012, is known to have at least six members and perhaps as many as a dozen. There is no documented evidence that the pack, named after nearby Huckleberry Mountain, has preyed on livestock until now.